PB&B sandwich photo by Kevin Reese. Used under a Creative Commons Licence. After I wrote about the utter nonsense of food combining last week I had a reader contact me to suggest that perhaps I could elaborate on the positive side of food combining. To be clear, this is not what is traditionally meant by “food combining” which is a complicated way of eating which erroneously is believed to aid digestion and is more based on not eating certain foods in conjunction with others than with eating a variety of foods together. I mentioned in my previous post that combining some foods can be beneficial in terms of absorption. Fat soluble vitamins (ADEK) need to be consumed with fat in order to be absorbed. This is one of the many reasons that a low-fat diet has been decried by dietitians. Skimmed milk with added vitamin D? No sense to it unless you’re washing down a croissant (or an avocado, nuts, or other fat-containing food of your choice). In addition to aiding absorption of fat-soluble vitamins, certain foods can help with the absorption of other nutrients. Foods containing vitamin C can help with the absorption of iron, particularly from plant foods in which the iron is less bioavailable than in meats. For example, eating peppers with your spinach salad can help you to absorb more iron. Or having an orange with your oatmeal, tomatoes and beans, etc. Of course, there are also instances where nutrients can hinder the absorption of other nutrients. Tannins and fibre may decrease the absorption of some minerals and medications. Oxalate (found in spinach and some other fruits and vegetables) can impede the absorption of calcium. As my astute reader pointed out, there’s also the benefit of glycemic control imparted by eating certain foods together. As any reader of Wheat Belly can (and likely will) point out to you, whole wheat bread has a higher glycemic index than white sugar. The thing that’s not taken into consideration when latching onto that fact is that we rarely eat whole wheat bread in isolation. Turn your bread into a peanut butter and banana sandwich or chicken salad sandwich and you’ve altered the glycemic load of the meal because you’ve added other macronutrients. Consuming fat, protein, or fibre can all help to mitigate the effect of carbohydrates on blood sugar. This is why, if someone with diabetes is experiencing low blood sugar it’s much better to give them candy or juice than a chocolate bar. On the flip-side, this is why most dietitians will recommend that you consume two food groups at snacks. Having a piece of fruit and a few nuts or cheese and crackers, berries and yoghurt, veggies and hummus… will help to prevent a spike in your blood sugar and keep you feeling full for longer that if you were to just have a piece of fruit. It also helps you to meet your nutrient needs if you include a vegetable or fruit as part of your snack. Tags: fat soluble vitamins, fibre, food combining, glycemic index, glycemic load, iron, nutrient absorption, nutrition, wheat belly | Permalink. And this is a prime example of why 140 characters are not enough to provide nutrition counselling. It does appear that lower doses of vitamin A (such as the quantities you might obtain from eating the foods listed above) may increase absorption of non-heme iron (i.e. plant sources of iron). However, the increase seems to be minimal in comparison to consuming an iron supplement alone. In addition, when vitamin A supplements of 1, 800 µg were consumed with iron supplements they actually deceased iron absorption (1). Vitamin C, however, has been proven to increase iron absorption (2). 1. Do your own research. It’s difficult for a 140 character tweet to convey sufficient information for you to make an informed dietary decision. 2. Try to get most of your nutrients from food, rather than supplements. While consuming foods that contain vitamin A may aid in iron absorption, consuming vitamin A supplements may actually decrease iron absorption. 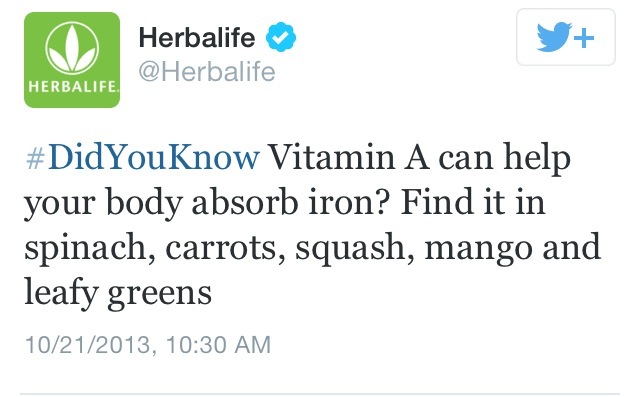 Tags: Herbalife, iron, nutrition, twitter, vitamin A, vitamin C | Permalink. I’m getting caught-up on my nutrition article reading. You may have seen headlines all over the news a few weeks ago about how many children are drinking too much milk. I think that many parents have been convinced, dare I say by the dairy industry (under the guise of Canada’s Food Guide), that children need lots and lots of milk to have strong teeth and bones. Unfortunately for all of us milk loathers who suffered through the dreaded milk program in grade school, this is not true. Yes, milk is a good source of protein (8 grams per cup), calcium (30% of our daily needs as adults), and vitamin D (45% DV – although it’s important to point out that cow’s milk is fortified with vitamin D so I don’t really think it should be praised for that). The thing is, there are plenty of other foods that contain these nutrients. If your child suffers from lactose intolerance or a milk allergy they are not going to develop rickets or osteoporosis (yes, it’s a pediatric disease with adult consequences) as long as they obtain enough of these nutrients from other sources. If you’re child just doesn’t like milk, or you choose not to serve them milk for whatever reason, they can still live healthy and productive lives. One of the reasons that excessive milk consumption in children is an issue is that it tends to lead to insufficient consumption of other nutrients, specifically iron. Iron deficiency can lead to anemia which can be indicated by paleness, fatigue, decreased immune function. There is also the potential for poor growth and development as a result. Good food sources of iron include: oat bran cereal, clams, spinach, beans and lentils, tofu, egg yolks, beef, and baked potatoes. Using uncoated cast iron cookware (especially to cook acidic foods such as tomato sauce) can also increase iron consumption. Consuming vitamin C containing foods (such as citrus fruits, peppers, and tomatoes) with iron-containing foods can also increase the amount of iron absorbed. Good food sources of protein include: tuna (and other fish), poultry, meat, beans, legumes, yoghurt, tofu, nuts, eggs, even grains. Good food sources of calcium include: yoghurt, fortified orange juice, many cheeses, spinach and other dark leafy greens (kale, broccoli, asparagus), tinned salmon (with bones) and sardines, fortified cereals, and tofu. Good food sources of vitamin D include: egg yolks, fatty fish (herring, eel, salmon, sardines, tuna), and fortified cereals. There is a huge proliferation of “milks” on the market these days. You’re no longer limited to cow’s milk or soy milk. There’s almond milk, coconut milk, sunflower milk, quinoa milk, hemp milk, rice milk… The choices can be overwhelming. The first thing you should check for is added sugar. No need to consume any more sugar than we already do. Next, check your labels to ensure your “milk” is fortified. Finally, check for unwanted ingredients like added oils. Beyond those tips, go for what you (or your child) actually likes. With all the options available you should be able to find one that will be both pleasing to your palate and provide the nutrients you need. Tags: calcium, child nutrition, iron, milk, protein, vitamin D | Permalink. I was taking a break from trying to figure out what to blog about and reading my twitter feed when I was inspired by a tweet: “Fun stat: Kale has more iron in it than beef and Kale chips are YUM. Also a good source of protein,calcium,and fibre. More calcium than milk”. Was this tweeted by someone with any sort of nutrition background. Nope. I love that the Internet gives everyone a voice. Unfortunately, that’s also the downfall of the Internet. Misinformation is easily spread with the click of a button. What’s wrong with this tweet in particular? It’s not that kale isn’t great. Kale is awesome and probably the most nutritious of all the leafy greens. The problem is that the facts provided in this tweet are misleading. Let’s look at a comparison of the iron in kale and beef: one serving of kale (1/2 cup cooked) contains 0.62 mg of iron, one serving of beef (75 g cooked steak) contains 2.06 mg of iron. You don’t have to be a math whiz to figure out that the beef clearly has considerably more iron than the kale. It’s also important to bear in mind that the form of iron in meat (i.e. heme iron) is more easily absorbed than the non-heme iron found in plants. That means that you’ll absorb a greater percentage of the iron in the beef than you will of the iron in the kale (or any other plant-based source of iron). Now what about the other nutrient claims in this tweet… Is kale a good source of protein? 1.3 g. Not too bad, also important to keep in mind that it’s not a complete protein, it doesn’t contain all of the essential amino acids. That means that you need to include other sources of protein to get all of the amino acids your body needs. Is kale a good source of calcium? 49 mg. Not too shabby, right? Well, the recommended daily intake of calcium for adults between 19-50 years of age is 1, 000 mg so you still need a LOT more sources of calcium in your diet. Is it more calcium than milk? One cup of milk has 316 mg of calcium. Even if we go measure for measure, milk has way more calcium in it than kale does. How about fibre then? 1.4 g. That’s okay. At the lowest end of fibre recommendations it’s about 6% of what an adult should be getting in a day. I don’t want to come across all down on kale. I truly love kale and I think it’s a great food. I just don’t want people to read one misinformed tweet and think that kale is a magic food providing them with practically all of the nutrients they need. As I’ve said before; there are NO super foods! You need to consume a variety of foods to obtain all of the nutrients that your body needs to function at its best. 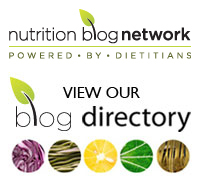 Tags: beef, calcium, fibre, healthy eating, iron, kale, milk, misinformation, nutrition, protein, super foods, twitter | Permalink.